baby but no car.. Is this possible? I live in London and really don't see the need for a car. We rent one from street-car when we need it, but there is all the hassle with installing a baby seat every time you need to use it. has anyone else who lives in a big city with little or expensive parking gone through this? We lived in Paris for a few months a few years ago without a car just fine, and will be moving there again next month, this time for a year, with no plans to buy a car. I foresee no problems. We have three kids, one of whom was an infant last time we were there. I don't know London at all, but in Paris buying food and clothing and getting to school is generally done by foot; and the metro is straightforward to navigate with kids as well. We live in Vancouver, my wife has always had a car, but I hate driving. Our six month old absolutely hates being in the car, and I would guess that she's been in it no more than a dozen times, mostly for going to get her shots, which might be why she hates it. We live very close to several grocery stores and transit hubs, so it's pretty easy for us to avoid the car. I think it must be at least three weeks since we've used it. i have a five-month old and live in hackney, which is so great for buses that not only do we not have a car we have barely used our stroller! You'll need a lightwight pushchair if you're going to use public transport and probably a baby sling/carrier. But you can actually travel much lighter than the baby-stuff marketing people would have you believe! And if you ever want to moan about bus fares/walking home in the rain just think of what you're saving in car upkeep and stress. Our most difficult family moments have been in the in-laws' car trying to navigate/find somewhere to park/entertain pinioned child. Nightmare. The only time I wish we drove is when it comes to going on holiday but if you can hire one then no problem. Yes yes yes actually very glad we don't have a car (in London). What would we need one for? Also, and I find this weird, cabs here don't require you to have a car seat (in the states, it might even be required by law), so we've left ours with my in-laws as there's no need for it here. Our south London maternity ward wouldn't let us leave the hospital unless we had a car seat with us - even though we were getting a cab home. I can see how it's eminently possible to manage in London without a motor - but I'm not sure I'd want to try. Having a colicky baby on the bus seems like it'd be a nightmare. It's a nightmare in the car too though! I do have a car but I don't need it, and only really use it for getting a big weekly shop, but plenty of people manage with the internet. Our hospital did the same thing (which is why we bought a car seat), but we've never had a problem with either our pram or the baby bjorn. We asked a cabbie and he told us no taxi's gonna ask you to have a car seat. Well, I for one am very, very glad that our days of heaving the buggy (or double buggy) on and off buses or up and down the steps at Gipsy Hill station are pretty much behind us (not because we drive everywhere but because Ava & Lulu walk everywhere). I'm sure we'd have coped but I really don't think we'd have done as much with the children over the last 4 years without our old Micra. Trips to the local shops, fine, but cross-London jaunts that take >90min by bus/Tube/train? Out of London trips? Visiting the folks on Merseyside when they were under two? I fear we'd have been saying no a lot more to social events and get-togethers if we'd been at the mercy of south London suburban public transport every Sunday. It's pretty much a breeze now (the only issue being Lulu's bus narcolepsy!) but there have been so many times I've been grateful for our little N-reg (and Pam's UK licence). I'm going to look at an easy baby seat to install in a hire car. but we will definitely try not to get one. A thought about the carseats - if you can establish whether the street-cars have isofix then fitting isofix car seats is a breeze - literally just clicking in and out. What kind of sling is that, Vicky? I have a Close and an Ergo, the Ergo is great for bigger babies (I used it with Howie until he was about 18mo and got too wriggly). I never did work out the back carry position, though. I've got the Ergo, and have been using it upfront for a few months to great satisfaction. But baby is nearly too big for front-carrying and haven't figured out back-carry either! Everytime I go to watch the instructional DVD, the guy doing karate kicks with baby-on-board just freaks me out. It's a wrap Meg. I've got several, it's a slippery slope into obsession/addiction I have to confess! 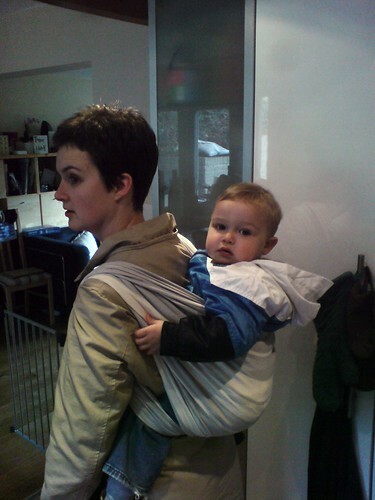 I had a stretchy wrap when Aidan was small but once he got too heavy for that I didn't realise there were other options. I found out in time for me going back to work and started off with Mei Tais, carrying him on front, then bit the bullet and worked out back carries, wishing I'd done it a long time ago - makes such a difference! I only started wrapping properly after Christmas but it's much easier now that Aidan's up and down all the time. I can get him up and down on a moving train, once you get the hang of it it's easy. It's the practice that's the key. Granted I live in a small city and work across the street (from our home) but it never crossed my mind to "need" a car for a kid. Especially babies! Buy a babyBjorn and you're set! with all due respect I wouldn't buy a baby bjorn, spend a little bit more and get a carrier that's better for your baby's hips and better for your back, which you'll be able to use for a lot longer than a bjorn. Bjorn's have been nicknamed 'crotch danglers' by some babywearers, as the baby hangs straight down and a lot of the weight is suported by their crotch. More traditional carriers, such as Mei Tais, wraps, ring slings, soft structured carriers (including the Ergo) etc. spread the weight much better, and if the baby is vertical then the baby sits in the carrier with their legs spread and knees higher than their bum so the weight's not on their crotch. Sure they're better than nothing but there are so many better carriers on the market. it just struck me, reading the "traveling with kids" thread, that one of our biggest problems in traveling is that the kids get carsick easily. (we don't own a car, but rent them for vacations.) i guess if a kid's in a car every day they get used to the motion, but if it's only a few times a year it's pretty disorienting. we do ride buses a fair amount, but there's so much stopping and starting in city traffic that i don't think you get the kind of sustained motion that produces sickness. anyway, that aside, i'm happy to be able to live without a car, and to not have to put my kids in them. it's true that getting around town can be a logistical challenge sometimes, but we manage. i've hiked strollers up and down a lot of stairs. and for our youngest, we have an ergo carrier, which my wife mostly wears as a front carrier and i wear as a backpack, it works well both ways. i finally did it with no help last week. but usually my wife's there to help. We have a baby and no car and so far (14.5 months) have found it to be quite manageable. But! Ivy is going to outgrow her infant carseat in the next few months or so, which means we need to buy a "convertible" car seat. I can't find anything anywhere on the whole wide internet discussing the relative merits of convertible car seats for people who don't own a car. Does anybody have any suggestions? In addition to the standard safety features, we are looking for something light and easy to install (without a base, obviously). We're in exactly the same situation but all I know is rear-facing is a zillion times safer in the event of a crash. There's this thing called the immi go that they use in Ubers. It's light and collapsible. Don't know about the safety rating. I might be wrong but I think there just isn't any way to keep them rear facing past a certain age/size. We had to turn k around pretty early because she was so tall. The recommendation is a rear facing seat until they are 24 months, but there are height/weight limits for rear facing seats. Ivy's short and slim so she probably won't outgrow the seat before she turns two.